TV host Brandi Milloy shops the drive-thru for these breakfast recipes. Brandi Milloy never imagined she would one day be known for food. “I always thought that I’d be just like my dad, who was a pilot in the Army,” says Milloy, whose family moved all over the world with the U.S. Military during her childhood. But a journalism degree would set Milloy along a much different course – from investigative reporting and entertainment news early in her career and later to a dream job at the lifestyle publication POPSUGAR. “I just never imagined my passion for food, people and culture could be a profession,” says Milloy. Through her role as host and producer of the online series, Eat the Trend and Get the Dish with Brandi Milloy, she stays on the pulse of the latest food buzz. Milloy, an enthusiastic foodie and self-taught cook, has no formal culinary training. But her passion for food – and overflowing creativity – have made cooking and baking her bread and butter. By day, she tests recipes and helps busy people prepare delicious, creative meals. In between, she’s a judge for Guy’s Grocery Games on the Food Network, a contributor on the Cooking Channel show Unique Sweets and a Today Show Tastemaker. “It's just been surreal. I wake up every day feeling fortunate,” says Milloy. Despite no formal training, this foodie’s culinary roots run deep. Both of her parents loved to cook and the dinner table was a dedicated place for her family of five to catch up with each other. But while Milloy has an exciting life on-camera, her philosophy in the kitchen is much different, guided by the mantra: keep it simple. Her favorite meal at home is meat and potatoes. When she’s on the move, her go-to is Chick-fil-A, even visiting her local Los Angeles restaurant the day of her wedding rehearsal. “I knew we’d have some time until we sat down to eat at the rehearsal, so I took my bridesmaids to get my favorite chicken sandwich,” she says. Recently Milloy brought her creativity into the Chick-fil-A test kitchen to find creative ways to help customers make a Chick-fil-A meal go even further in their kitchens at home. She shares three menu hacks using Chick-fil-A breakfast items to make a simple at-home recipe even easier. “This recipe is like sunshine on a plate,” Milloy says. The dish uses Chick-fil-A Lemonade, and is nearly as simple as the restaurant’s lemonade recipe itself (made with just three ingredients: lemon juice, sugar and water). 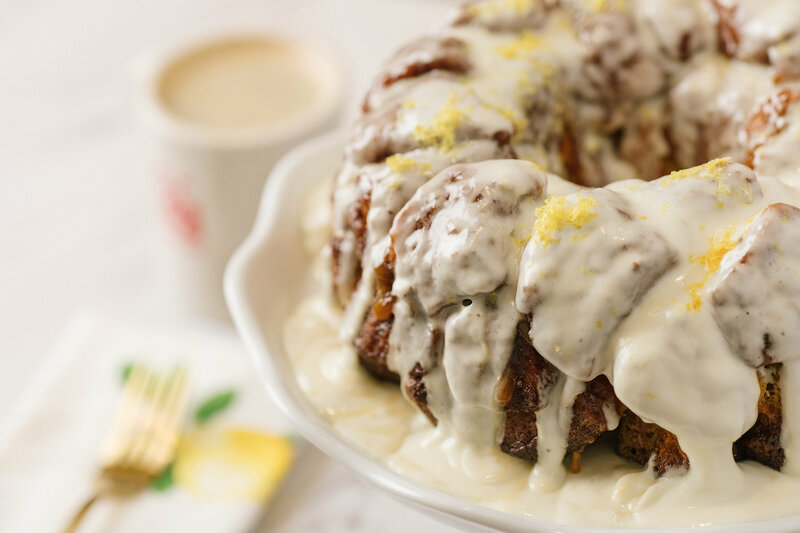 A sweet spin on the classic monkey bread recipe, this citrus cake is ideal for brunch or dessert! This simple recipe can incorporate any ingredients you choose. Milloy uses Chick-fil-A® Nuggets, bought ahead of time and chopped. “That way, I don’t have to sauté my own chicken – it’s already done for me,” she says. This easy breakfast only needs 10 minutes to bake – perfect for a weekday morning, or to make ahead on Sunday and eat all week. “I love this recipe,” says Milloy, who combines Chick-fil-A Hash Browns and Nuggets with bacon, eggs and cheese – and a technique she learned from a Michelin-starred chef – to create a simple-yet-hearty breakfast casserole. Milloy’s tip: Buy the Chick-fil-A ingredients a day in advance and cook the bacon ahead of time to shorten prep time.